Strong wind caused by Typhoon Mangkhut push waves up onto the waterfront of Victoria Habour on Sunday in Hong Kong. Hong Kong and southern China hunkered down as strong winds and heavy rain from Typhoon Mangkhut lash the densely populated coast. The biggest storm of the year left at least 36 dead from landslides and drownings as it sliced through the northern Philippines. 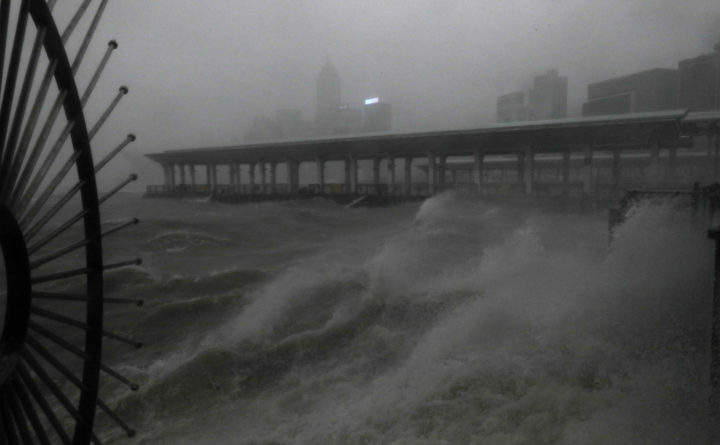 HONG KONG — Typhoon Mangkhut barreled into southern China on Sunday after lashing the northern Philippines with strong winds and heavy rain that left at least 64 people dead and dozens more feared buried in a landslide. The storm made landfall in the Guangdong city of Taishan at 5 p.m., packing wind speeds of 100 miles per hour. State television broadcaster CGTN reported that surging waves flooded a seaside hotel in the city of Shenzhen. The paper said the heavy rains brought storm surges of 10 feet around Hong Kong. In Macau’s inner harbor district, the water level reached 5 feet on Sunday and was expected to rise further. The district was one of the most affected by floods from Typhoon Hato, which left 10 people dead. In the northern Philippines, Mangkhut made landfall Saturday on the northeastern tip of Luzon island with sustained winds of 127 miles per hour and gusts of 158 mph. Associated Press writers Aaron Favila, Joeal Calupitan and Gillian Wong contributed to this report.